There’s more than one way to stuff a chicken. Yeah, that doesn’t have the same ring to it. Oh well. The point of my saying this is that when I was testing out recipes for the Gluten-Free Summer Cooking Event with Lindsay Olives, I actually made this recipe first. Why? Well, honestly, because I didn’t completely read the part where “summer cooking” was involved. Roasting a chicken? Not exactly summer cooking. But I love roasted chicken so much, that I immediately gravitate towards it at any given opportunity. That includes incorporating green olives into a recipe. So the pistachio, green olive, and raisin stuffing I made for these curried chicken breasts? It works perfectly stuffed inside a whole chicken as well. The curry seasoning works too, and rubbed all over, makes for a deliciously flavored chicken skin. (Our favorite part of the chicken in the Tasty Eats At Home household.) Normally, I dislike stuffing whole chickens. Stuffing, in the traditional sense, is some bready concoction that ends up drawing juices from the bird. This makes for dry meat that you can barely choke down. 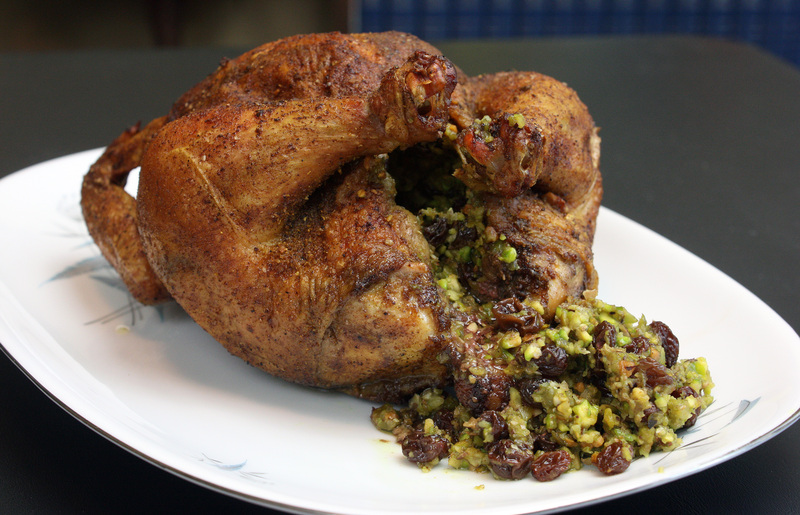 But a stuffing made from pistachios, olives, and raisins? Not the same. The stuffing and the chicken work synergistically – the stuffing is more intensely flavored from the juices, and the bird gains some flavor from the stuffing. Yes, it has to cook longer (so if you wish to wait until the weather cools to crank up the oven, I don’t blame you), but it’s so worth it. Here’s how to do it. Not hardly any different than those chicken breasts. Don’t have any Lindsay green olives? Check out my giveaway here! Preheat oven to 450 degrees. Mix curry powder and salt together in a small bowl. Rub spice mix inside and out of the chicken, including between the skin and the breast meat. Pulse pistachios in food processor until coarsely chopped and place in small bowl. Pulse garlic and olives in food processor until chopped (not finely). Stir in pistachios along with the raisins and olive oil. Stuff the chicken with the stuffing. Secure legs with twine and tuck wings under the body, and place on a roasting pan. Roast for 20 minutes. Reduce heat to 375 and continue to roast until juices run clear when a thigh is pierced, 40-60 minutes more. Transfer to a carving board and tent with foil. Allow to rest 10 minutes and serve.